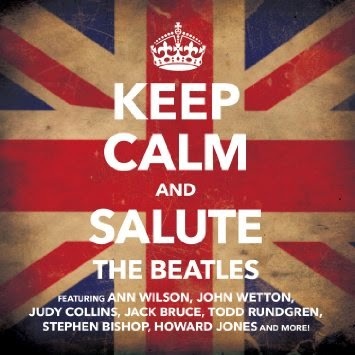 The title of this latest tribute to The Beatles says it all, "Keep Calm And Salute The Beatles," which is exactly what this collection will do. Cleopatra Records gathered some of the best classic rock vocalists to give their acoustic renditions of Beatles' classics. This new sixteen-song release begins with Heart's Ann Wilson taking on "Across The Universe," adding a meditative feel to the song's already mind-expanding lyrics. John Wetton (King Crimson, Asia) tries to simplify "Penny Lane," while the late-Jack Bruce (Cream) delivers a classic sixties sounding, spot-on rendition of "Elanor Rigby." Singer/songwriter Andrew Gold feels right at home with his delivery of "Norwegian Wood," while Todd Rundgren steps out of his comfort zone for the peaceful feel of "Hide Your Love Away." Howard Jones' soothing vocals fits perfectly into "And I Love Her" and Felix Cavaliere gives us a nice surprise on this acoustic rendition of "Ticket To Ride." Singer David Clayton-Thomas (Blood, Sweat & Tears) adds very little to the timeless sound of "Yesterday," but pays a wonderful tribute to the song. The album finishes up with Billy Sherwood paying tribute to George Harrison with his heartfelt rendition of "Something" and Leo Sayer taking on the epic "Hey Jude" with flying colors. The album was released on April 28th through Cleopatra Records. To find out more about this latest Beatles tribute, please visit cleorecs.com.